Last year average tuition rates over US colleges is 4.40 % for in-state tuition and 4.25% for out-of-state tuition. How about last ten years? We analyze US colleges tuition rates for over the past 10 years (2003 - 2012). Here are the analyzed results as tables and graph by tuition change, year on year tuition rate comparison, and 10 year cumulative tuition rates. The analysis is done through 3484 US colleges and universities. 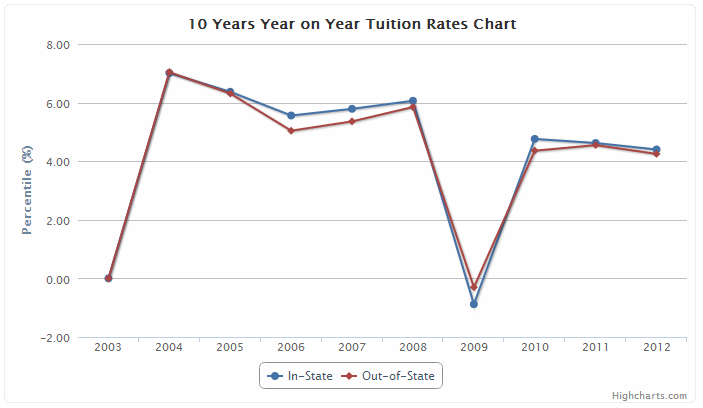 One interesting thing is the 2008-2009 tuition - the first year for Obama. The tuition goes down only at that year. 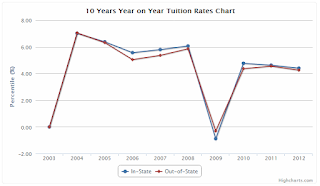 The tuition increase over 50 % as of ten years ago.